As son of the great philosopher Georg Wilhelm Friedrich Hegel, Karl Hegel initially stood in his father’s shadow. After completing his studies and spending time in Italy, he returned to Germany and took on a position as professor of history in Rostock in 1841. In 1856, he was appointed at the newly created Chair of History at FAU. He quickly became famous upon the publication of ‘Chroniken der deutschen Städte’ (chronicles of the cities of Germany), establishing himself as an outstanding historian. He is regarded as one of the most important historical researchers. 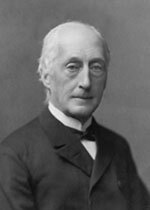 From 1856 until his death in 1901, Karl Hegel was a key part of FAU for almost half a century. In 1872, he founded what would later become the Institute of History. Each year, the Department of History holds a memorial lecture in his honour, to which it invites renowned historians from Germany and abroad in order to discuss fundamental questions about the theories and methodologies used in their discipline, as well as issues surrounding modern source texts on historical subjects.